ALBUQUERQUE, N.M. — Using an artful combination of nanotechnology and basic chemistry, Sandia National Laboratories researchers have encouraged gold nanoparticles to self-assemble into unusually large supercrystals that could significantly improve the detection sensitivity for chemicals in explosives or drugs. 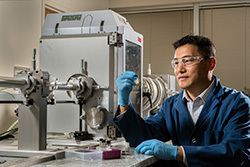 Sandia National Laboratories researcher Hongyou Fan holds a container enclosing gold supercrystals in front of a small-angle X-ray scattering instrument, one of the tools he uses to characterize his unusual creations. (Photo by Randy Montoya) Click on the thumbnail for a high-resolution image. The work was funded by the U.S. Department of Energy’s Basic Energy Sciences office and by Sandia’s Laboratory Directed Research & Development program. 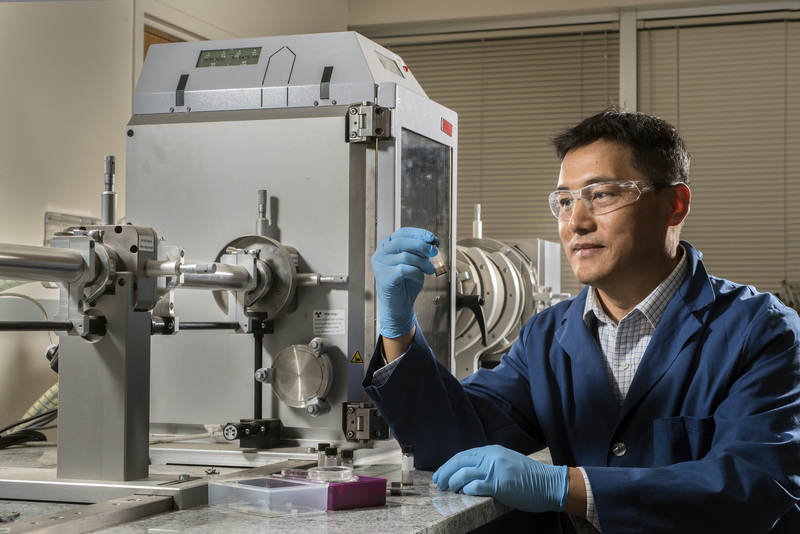 Work was carried out in part at the Center for Integrated Nanotechnologies, a DOE Office of Science user facility jointly managed by Sandia and Los Alamos national laboratories.